A Darling Kind of Life: Who would have thought that Roman Numerals could make a girl cry...? Who would have thought that Roman Numerals could make a girl cry...? This morning started off so happy! :) After getting Cale up and ready for bed, we played Crazy Eights! We played this on Christmas with TJ and Kristen, and ever since, Cale wants to play a lot! Well, it's something that makes him happy, so I dove right in! Every chance we had of quiet, even if it was for 5 minutes, we had cards in our hands! Through the day we played a total of 9 games, and Cale kept a smile the whole time we would play. For our second game, I told Cale it was his turn to shuffle and deal. He took the cards from me and shuffled! Like a really good shuffle! I expected him to mix the cards together like he had before...nope! It was so crazy! His hands are working together and his muscle memory is shining through! We didn't have a ton of time, because Dr. Howe came in. She did the questions with Cale, but this time he struggled a lot. I'm not sure he even got above 50. One of the questions is what kind of place is this. Usually he'll say, hospital or Army base. Today he said "prison." :( Poor guy! I know it must feel like that some days. He had gotten really sad right before she started questions so I know he was just having an off day. We'll go at it again tomorrow! Patty started testing again. She had done this same test in October and it took almost the whole month! She told me today that what he did yesterday took him a week last time. I remember sitting in session after session, having to remind myself that the test was not what decided how far Cale was or how far he was going to go. I had to constantly remind myself because he was having such a hard time with very simple questions. Towards the end, I stopped sitting in on the speech sessions because I didn't want to be any kind of distraction and make it even harder. Today when I was sitting there watching him answer questions, my mouth fell open and stayed (good thing no bugs were flying!). 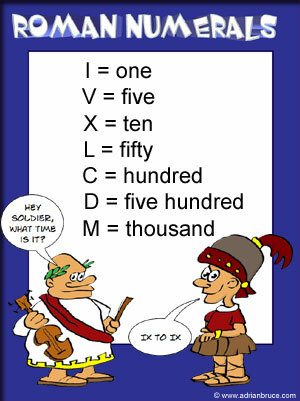 One page she turned to was 5 questions about Roman Numerals. Last time I watched Cale do this page, he was so frustrated and had no idea what any of it was. That was hard because I knew that he knew and it hurt to see yet another thing so hard for him. Finally, Patty had asked him to just guess and that's just what he did! He pointed and got all of them wrong. When she asked him today, he pointed to the first answer and did it so confident! Then he did the next, and the next! He got 5 out of 5 right!!!!!! Tears. So many tears! Happy tears! It was amazing! I felt like the Lord had given me a package today; He dressed it up so fancy and pretty on the outside. I got to see it be opened right before me! It was a miracle in my husband. I can't even describe the moment. Cale did that with so many of the questions. He struggled with some, but nothing-NOTHING compared to last time! I can't wait to share at the end how great he did!!!! Does something seem wrong with this picture?! Haha! Yesterday, Pat took Cale in the Activity room that has couches, chairs, and tables, to see how Cale did walking around all the furniture. He had Cale sit on the chair and get up (Cale did awesome getting up because it was a low chair! 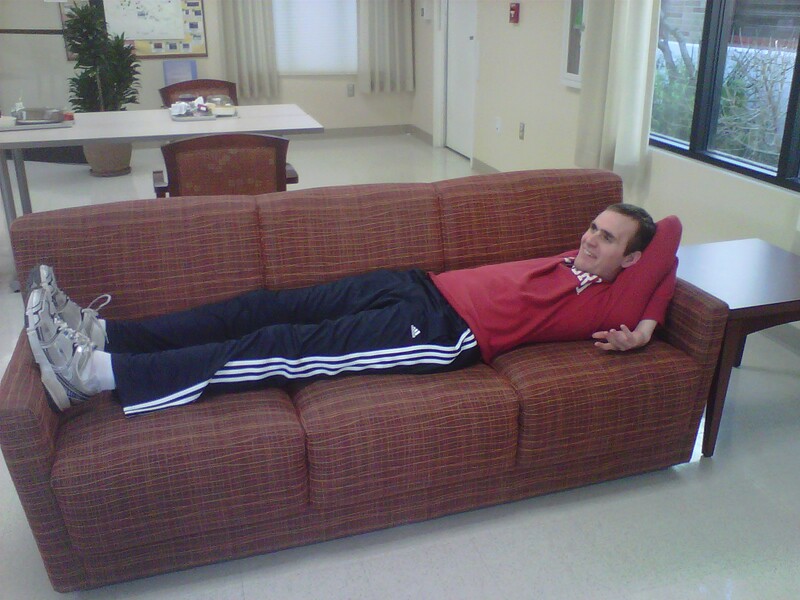 ), Pat said "get comfy on the couch (and Cale sure did! ), and then sit at a table like he was going to have a meal. Then, today, Pat first had Cale get on the treadmill and work really hard, then let him play Halo for the last 20 minutes, as long as Cale was standing while he played! With Cale getting so upset, we're trying to keep things fun, while still getting lots of work in! Pat does such a great job with Cale, which is sooooo great! And such a blessing. Tonight was Bingo again! Cale walked in with his cane for the first time! The Bingo guys have seen Cale when he first came in and didn't last 10 minutes into the game, seen him come in with his wheelchair, upgrade to walker, and now he walked with his cane! It's so exciting! The big thing tonight was that Cale found almost all of the numbers by himself! I hardly had to help. On nights that he's doing really good, and he's awake, he'll find the number if I show him the row. Tonight I didn't have to show him anything! I was amazed at how quickly he was able to find them too! Go Cale! Thank you everyone that has left a comment on yesterdays post for Cale so far! I know it's going to be such a blessing and give him a strong boost right before his surgery and when he comes out of it! Such a HUGE blessing!! I wouldn't let them take em either!!! That last part made me laugh out loud. Tell Cale he needs to work on the subtle hints! All I could think as I read this post today is that old song "What a Mighty God We Serve". So awesome! You got some serious posts yesterday:) Ha, ha. I love it. Yippeeeeeeee!!!!!!!! I wish I could play 9 hands of cards !!!!!!! I am so excited for all that God is doing in Caleb and I agree with the above Post by Julie What A MIGHTY God We Serve.... So happy for the 2 of you !!!!! LOVE you guys! Reenie Bovier !!! !